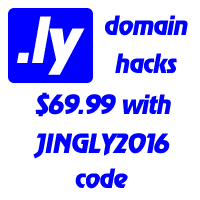 There were many bits and tips on .LY prices jotted on this blog, however we never had a post so far with some nice overview of most prominent .LY sales. A bit of market background. There are about 18,000 words in English language ending with "ly". However only few hundred are really premium like week.ly or brief.ly. 8,000 "ly" words can be found here and those 73 among the top 3000 English words here. There about 10k .LY names registered, 80% of them are handled by Libyan Spider. In January this year, some one paid about $30k via Sedo to acquire the following seven “ly” names: sciencedaily.ch, sciencedaily.cz, sciencedaily.dk, sciencedaily.jp, sciencedaily.kr, sciencedaily.mx, sciencedaily.se. What are your plans regarding it? LLL.LY are now difficult to get.